Auto Liability - What's Not Covered? Commercial auto liability coverage protects your company against claims by third parties who seek compensation for bodily injury or property damage sustained an auto accident. Like most types of insurance, auto liability coverage is subject to exclusions. Exclusions may eliminate coverage for risks that are uninsurable or that are covered by other types of policies. Some exclusions preclude certain risks but then add back some coverage by way of exceptions. The following exclusions are found under liability coverage in a typical commercial auto policy. Auto liability insurance excludes bodily injury or property damage that is expected or intended from the standpoint of the insured. This exclusion generally applies if the insured named in a claim or suit intentionally caused injury or damage to a third party via an auto accident. For example, you rear-end another vehicle in a fit of road rage with the intent of harming the other driver. If the driver is injured and sues you for bodily injury, the claim may not be covered. Liability you assume under a contract is excluded. However, coverage is provided for liability you assume under an insured contract as that term is defined in the policy. Your auto policy will not cover benefits you are obligated to pay under a workers compensation, disability or unemployment compensation law. These benefits should be provided by a workers compensation policy, disability policy or government program. Your auto policy excludes claims against you (the employer) by injured employees. Such claims are covered by employers liability coverage. The exclusion contains two exceptions. The first provides coverage for claims by injured domestic employees who not eligible for workers compensation benefits. The second exception affords coverage for liability you have assumed under an insured contract for claims arising from injuries to your workers. While injured workers are typically barred by state laws from suing their employer, they are generally permitted to sue someone else who may be liable for their injury. For instance, suppose an employee of a subcontractor has been injured in an auto accident at a job site. The worker sues the general contractor for negligence. General contractors don't want to be sued by injured employees of subcontractors. Thus, construction contracts often require subcontractors to assume liability for claims against the GC that arise from injuries to the subcontractors' employees. The contractual liability exception cited above provides coverage for this assumption of liability. This exclusion precludes coverage for a claim by one employee against another for an injury sustained on the job. The exclusion serves the same purpose as the co-employee exclusion found in a general liability policy. This exclusion eliminates coverage for damage to a vehicle you own or that is in your custody (such as a rental vehicle). You can protect yourself against physical losses to autos you own or hire by purchasing physical damage coverage. The "care, custody, and control" exclusion also applies to damage to property that is being transported in or on an auto. You can insure property you are transporting in a vehicle by purchasing transit insurance. 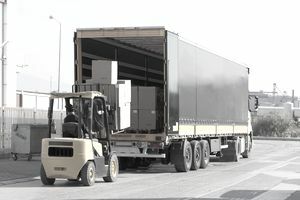 As a general rule, auto policies cover bodily injury or property damage that occurs in the course of loading or unloading of property onto or off of a covered auto. For example, you purchase a heavy piece of plywood at a hardware store to use in your business. You and a store employee are loading the plywood onto your truck when you accidentally drop one end of it. The plywood falls onto the worker's foot, crushing his toe. If the worker demands compensation from your firm for his injury, his claim should be covered by your auto policy. Auto liability coverage does not apply to injury or damage that occurs before you begin loading property onto an auto or after the property has been unloaded. When property is deemed "loaded" or "unloaded" may vary from state to state. Accidents that fall within the "handling of property" exclusion in your auto policy are likely to be covered by your general liability policy. Thus, it is important to have both types of coverage. Your auto policy won't cover injury or damage that results from the movement of property by a mechanical device (except a hand truck) unless the device is attached to a covered auto. For example, an employee of yours delivers bags of concrete to a job site. Your employee is using a forklift to unload the bags when he accidentally drops the load, injuring a bystander. The injured party sues you for bodily injury. The suit is not covered by your auto policy since the forklift was not attached to your truck. The suit would instead be covered by your liability policy. Claims that arise from the operation of mobile equipment are not covered by a commercial auto policy. Liability coverage for mobile equipment is provided by a general liability policy. Your auto policy won't cover claims alleging injury or damage that results from work you have completed. Such claims may be insured by your general liability policy under products-completed operations coverage. Auto liability insurance contains a broad pollution exclusion. Claims that arise out of war or racing activities are excluded. Auto policies aren't intended to cover such risks.